On this edition of No Holds Barred, host Eddie Goldman once again spoke with our colleague, correspondent, and award-winning boxing writer, Charles Farrell. He is also co-editor of The Boxing Standard. 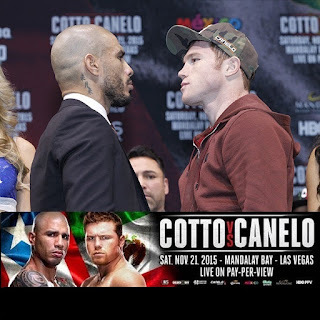 Our main focus was the major fight card taking place this Saturday, November 21, as Miguel Cotto (40-4, 33 KOs) takes on Saul "Canelo" Alvarez (45-1-1, 32 KOs) at the Mandalay Bay Events Center in Las Vegas, Nevada. This card will be shown live in the U.S. on HBO pay-per-view and in the U.K. on BoxNation, as well as on many other networks around the world. We spoke with Charles Farrell by phone Thursday. "Were they both in their prime and were they both fighting at 147, I would go with Cotto. He's a better fighter. He's more versatile. He is actually the better puncher of the two," he said. "But I think at this point it's a question of their respective arcs, where each one of them is heading. And I think it's a propitious time for Alvarez." He continued, "I think that Cotto will start well. He's a good boxer, and Alvarez is a slow starter. But the years and the abuse that he's going to take from Alvarez, who is a good body puncher, are going to catch up with him. And I don't think anybody is going to sit around and let him take too much abuse. So my guess is eight or nine rounds." Besides discussing more on this fight and the pay-per-view card, we delved into our continuing analysis of the Premier Boxing Champions (PBC), which has been running numerous fight cards on non-pay TV in the U.S. since March. We discussed PBC's stagnant and sometimes sagging TV ratings, how PBC has offered many competitive and exciting fights and upsets, how PBC has good matchmaking but has not been good at star-making, and much more.